THIS REVIEW OF ‘BRONZE AGE BOOGIE’ #1 IS SPOILER-FREE. by Clyde Hall. It’s a hung jury where nostalgia’s concerned. For some, tomorrow is gone and wasn’t really the ‘good ol’ days’ everyone makes such a fuss about anyway. Better to focus on now, or even tomorrow, in order to make them better. Or people pine for what was memorable and fine in their past, but to the exclusion of any new approaches regarding beloved genres and mediums. “Captain Squarejaw is NOT Vegan! He gnaws ribeyes. Raw! He’s a protein-crazed brute as introduced by creator Eldon McRatchett in 1943, and his vision is sacred. SACRED!! !” Most of us linger somewhere between the poles, often depending where we’re at on our trek through this life and how many times the mileage has rolled over on our mortal coil. AHOY’s Bronze Age Boogie #1 addresses nostalgia with humor and a keen eye cast upon sentimentality’s flaws and benefits. In its first wave of books, AHOY brought a trademark vision of funny but ever-thoughtful handlings of the afterlife, space-faring felinoids, and superheroes Golden Age and gritty in switched multiverses. Bronze Age Boogie, as the first whitecap in their second wave, continues in similar fashion. It’s all in the title. Bronze Age warriors mingled with boogie nights and 1970s trappings familiar to the Bronze Age comics crowd? Sure, why not? Do tales of time-travel and paradoxes served up by Barry or X-Ad Infinitum wear on you? Get ready for temporal-hopping chimps! Stir in doses of H.G. Wells’ Martians on the rampage and season with dino-riding zombies. 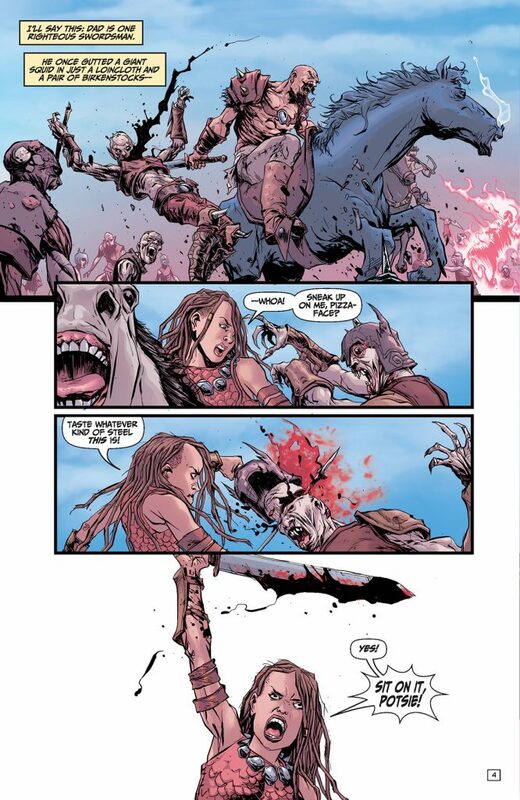 But it begins with a young barbarian princess who corrects her sword-n-sandal father’s grammar while using pop culture future slang. Straddling 1975s B.C. and A.D. seasoned scribe Stuart Moore concentrates his story on the ways various characters interpret their ‘good old days’. For a barbarian king, it’s when he was a lad seeking adventure and battle, not a ruler shouldering the responsibility of defending his realm. Which is a yawn for his daughter, who longs for the wonders of the far-flung future she’s been permitted to peek into. That very future, to some residents, is a far cry from their ‘good old days’ when they had massive funding and resources to battle chronal threats. The venue is set for all parties to experience a redefinition of their collective good old days in response to the many dangers confronting them all. In the meantime, Moore allows all manner of wackiness, often with homages to the story-telling styles of Bronze Age comics. He’s having fun. Either that, or he’s miserable and spinning the most enjoyable of tales for his readers as penance. 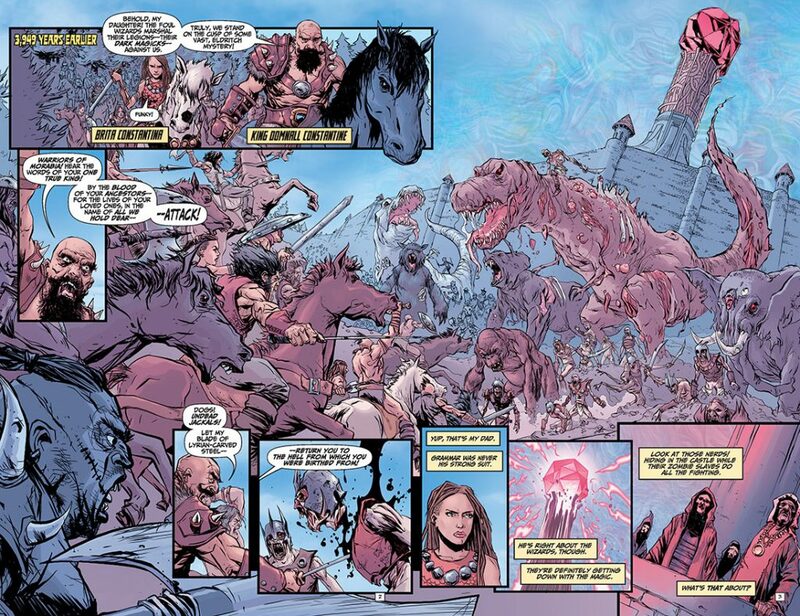 Artist Alberto Ponticelli, whose work dazzled on TKO’s Goodnight Paradise last year, adroitly shifts from one 1975 to another—the era of disco one moment, the barbarian frontier of pre-history the next. Colorist Giulia Brusco helps make this possible, her yesteryears sandy and smoky, her vision of the 70s lit by neon and mirror balls. The backup story from Tyrone Finch and Mauricet begins in a spirit of The Shape of the Water if applied to the Space Race. While it was enjoyably predicable in its opening episode, it leaves much leeway for how it proceeds. More importantly, it carries forth the witty tone of the primary tale. And bears in space suits as depicted by Mauricet—those panels alone are worth cover price. Speaking of price, AHOY continues to be a great comics bargain. The issue includes text sections from Bryce Ingman and Kek-W, with limited illustration by Shawn Crystal and Darick Robertson respectively. In the first wave, these AHOY bonus features were wonderful addendums, just as jocular as the comic stories. The trend continues with an examination of animal control difficulties from Ingman that deserves to be its own animated short. Kek-W’s piece on beating the dread writer’s block isn’t just sparkling in inappropriate suggestions, it’s giggle-producing, because we’ve pondered some of these venues to beat a deadline, propriety be damned. Whether you’re a nostalgia fiend (guilty), or one who enjoys experiencing what new creative talents have wrought (also guilty), Bronze Age Boogie #1 feels your pain. Its struggle between eras strives to parallel your own and provide crooked smiles along with perspective. 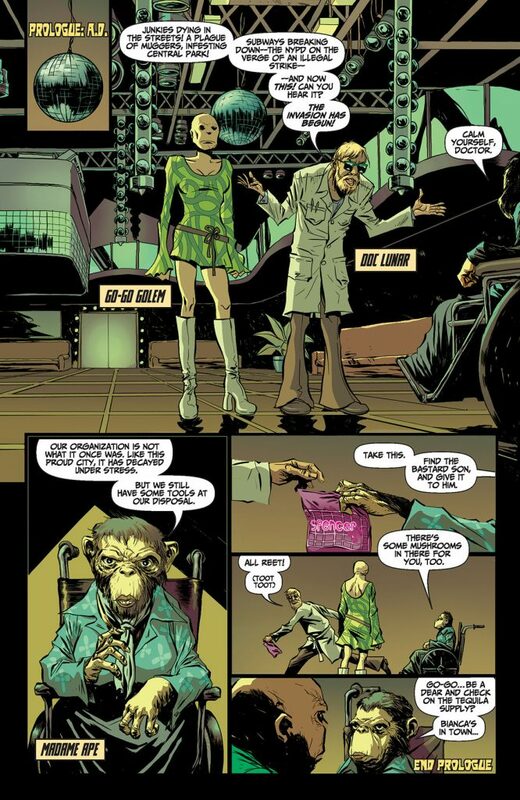 Mirthful snickers are spurred by delight with talking chimps. Others by fierce barbarian warriors unexpectedly bellowing battle cries born of situation comedies. No matter how inconsistent our devotion to nostalgia may be, the smiles from this book are unwavering. Written by Stuart Moore, Tyrone Finch, Bryce Ingman, and Kek-W.
Art by Alberto Ponticelli, Mauricet, Shawn Crystal, and Darick Robertson. 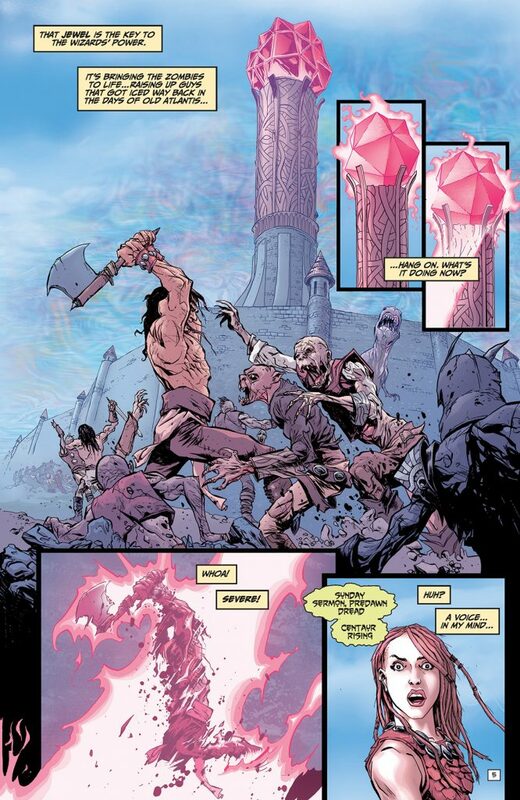 Colors by Giulia Brusco and Lee Loughridge. 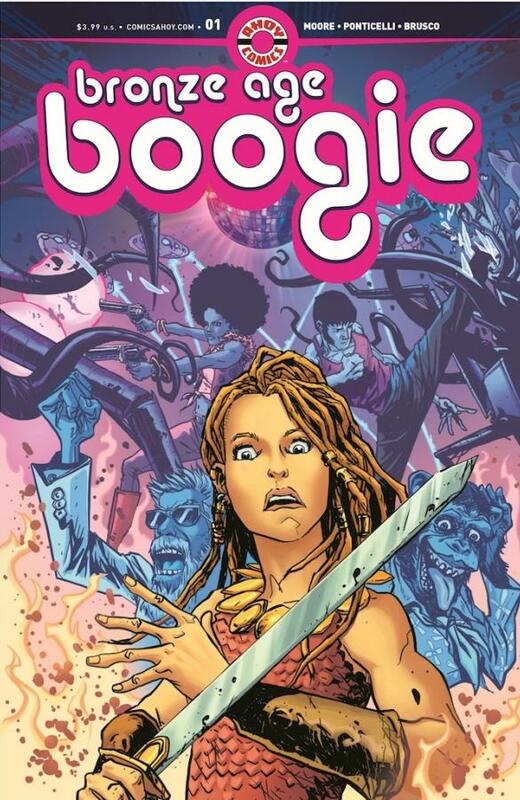 Check out this 5-page preview of ‘Bronze Age Boogie’ #1, courtesy of AHOY Comics!